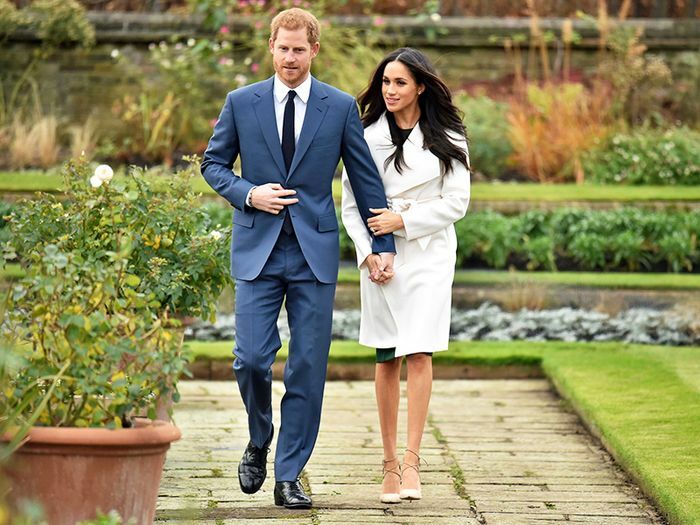 Meghan Markle's style is already under an intense microscope since her engagement to Prince Harry was announced earlier this week, including the news that the sunglasses she wore to the Invictus Games this summer increased sales for the UK brand by 1000%. The latest item to greatly benefit from Markle's approval is veteran Italian brand P.A.R.O.S.H. Markle wore a dark green midi sheath dress with a bow at the waist for her engagement photocall and first official interview with Prince Harry (watch it below). The founder of the brand, Paolo Rossello, told The Telegraph, "The dress was sold out in less than one hour in all shops and online." He said of her choice of the dress, "It's a Parosh iconic dress enriched with bow for this season, but suitable for any occasion." If you love the pretty, timeless dress, you're in luck. The brand has already begun taking pre-orders for it in all three colors (including the green) and renamed it The Megan Dress (wouldn't you? ), with deliveries beginning on December 13. How's that for supply and demand? Keep scrolling to shop the dress and a few other classic P.A.R.O.S.H. dresses that Markle would love. Next up, watch Markle's first official interview with Prince Harry.